Nova Direct acquires a new evolution in Digital Print! 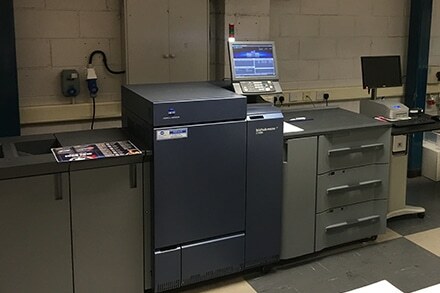 Nova Direct, partners with Konika Minolta, recently took delivery of the latest and greatest in Digital Print technology to come out of the Konika Minolta HQ. The Bizhub Press C1085 features full colour support, high productivity and paper handling ability as well as high image positioning accuracy, allowing Nova Direct to save your business money on your next digital print campaign. We understand the importance of consistent and exceptional quality, and with the help of our all-new C1085, we are able to minimise colour variance to provide high-quality images, suppress colour shift by maintaining stable main body internal temperatures. With an unparalleled density sensor and algorithm controlled colour feedback system the C1085 provides realisation of active colour management and stability, catering to the very minute specifics your business may request. The precision and work provided by the BizHub Press C1085 does not end with just printing. The system can be built to realise optimum added value and product differentiation. Due to constantly diversifying needs in the digital print industry the output range of commercial printers has to be widen to keep up with the market. Due to the widened range of the C1085, post-processing that has been outsourced in the past can now be performed through an in-house integrated production process to create added values on the cost and delivery fronts, thus adding to and expanding profits. With diversifying needs come diversified and advanced solutions. In partnering with Konika Minolta, Nova Direct is able to offer a range of bespoke Augmented Reality campaigns. Augmented Reality (AR) is a live direct or indirect view of a physical, real-world environment whose elements are augmented (or supplemented) by computer-generated sensory input such as sound, video, graphics or GPS data. By implementing AR on your next marketing campaign with Nova Direct, your business can take the 21st century by storm and lead in a new and expanding market segment. Nova Direct welcomes you to stop by and have a look at our new BizHub Print C1085 by Konika Minolta and also our Augment Reality systems. Please contact us if you have any questions or to get a quote on your next digital print and marketing campaign.